“The Carpet Merchant Of Konstantiniyya” is Reimena’s proudest work to date — and it is generating considerable buzz in the industry. This spring, the graphic novel was nominated for an Eisner Award, the industry’s equivalent of the Academy Awards. It is the first Malaysian creator-owned work to be nominated. 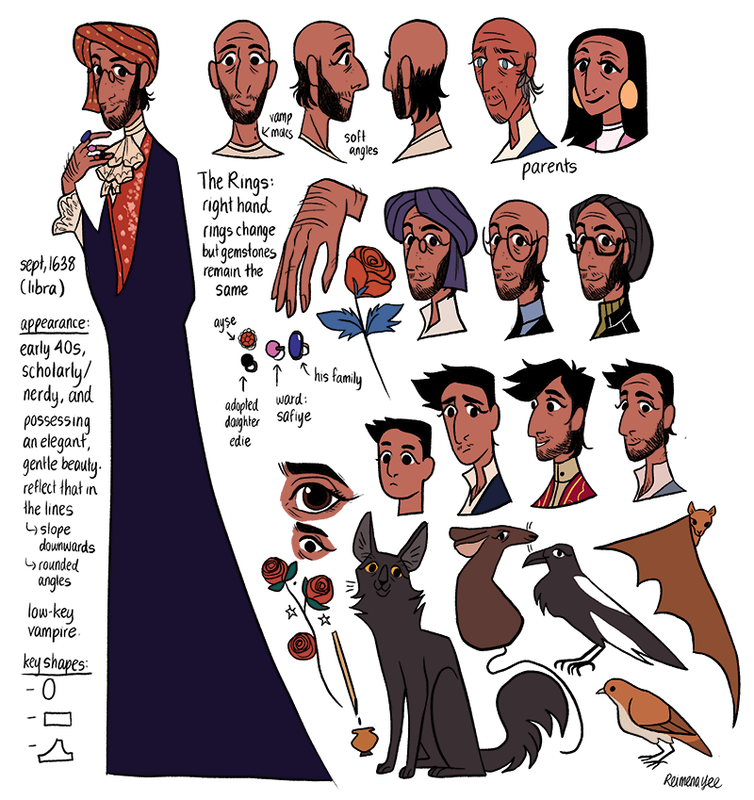 On the heels of her historic nomination, I spoke with Reimena about “The Carpet Merchant Of Konstantiniyya,” how her STEM background inspires her art and what it is like to be a young woman in the comics industry. Bianca He (BH): To start, can you tell Assembly readers a little bit more about yourself? Reimena Yee (RY): I’m a Malaysian-born, Australian-based artist, writer and designer with multiple projects in diverse areas of the visual arts, like games and editorial illustration. I spend a lot of my time developing graphic novels — books that combine long-form storytelling with comics. That’s my work. On my off days, I traverse through social media and am a voracious reader. BH: Receiving an Eisner Award nomination at such a young age is an incredible accomplishment. Has the nomination already made a difference in your life? Being nominated for one of the top comics awards, for a story I truly loved and believed in, felt like receiving confirmation from the universe — call it God or a higher power — that the unknown territory was where I was meant to be. BH: In an interview you did with Comics Beat, you mentioned that you were coming from a STEM background — where and what did you study? What inspired your switch from STEM to illustration? RY: I am a University of Melbourne alumna, with a Bachelor of Science in psychology. The way that degree was structured in university allowed me to pursue multiple subjects mostly in the field of sciences and some in other departments. For example, in my second year I studied biology, anthropology, psychology, astronomy, animal science and the history of science with religion. That flexibility was what attracted me to pursue my studies in Melbourne. People may say it lacks focus and diminishes future career prospects, but personally I saw it as an opportunity to indulge my passion for learning. As for the second question, I’ve always juggled art with the sciences since before secondary school. It wasn’t so much a switch as finally deciding to focus on something. BH: You’ve mentioned that your STEM background inspires your illustrations — could you talk a little more about this? RY: STEM taught me how to explore and observe the world, and to always question everything while holding on to wonder. It strengthened my appreciation for the development of ideas, as well as gratitude for being part of this ever expanding universe. All those things carry over to my artistic endeavours, creating a feedback loop of inspiration and learning. Doing both has also given me access to a wider pool to connect ideas with. BH: When did you first start drawing? What drew you to comics? RY: Like almost everyone I started drawing when I was a kid. My reason for drawing has changed and matured over time, but what stuck was a joy for putting characters into all kinds of situations. For a long time I thought drawing and writing were two separate processes that didn’t mix, until my mind was exposed to the unique and challenging ways comics can tell a story. It makes sense too to focus on comics since so much of my storytelling depends on imagery. BH: What’s your proudest work so far and why? RY: “The Carpet Merchant of Konstantiniyya”! I loved getting to know all the characters in that story, with its message of love, hope and kindness — which is much needed given the current state of our world. I’m so grateful to have completed it, and I could see it as a story I would still be proud of in old age. BH: Creating a comic book about another culture — in the case of “The Carpet Merchant of Konstantiniyya,” Turkish culture — can be intimidating. Why did you choose this subject? How did you work through all challenges? RY: The protagonist was someone I thought of when I was 15, as part of the cast for another comic (set in the same universe). Years later when I had to write his backstory, I needed to confront everything that came with his characterisation, particularly his upbringing. You’re right about it being intimidating! One of the worst things a writer can do is to misrepresentation, because even though the character is fictional, his identity and personality are rooted in real societies and histories. I spent so much time debating and unpacking my intentions. I discussed with some friends who belong to that faith. I did as much research as I am able to within the scope of my situated knowledge. This is where you can see the STEM background reveal itself. I’m not satisfied until I’ve turned every stone, seen every idea from multiple angles... Even then there’s always the possibility I missed something. But that’s what learning and storytelling are about: progress in small steps. BH: What’s your favorite part or page in “The Carpet Merchant of Konstantiniyya”? RY: The pages when I had to do the least drawing. OK, I kid! The comic has several moments that I’d consider my favourites because of their narrative importance. I especially like scenes where the protagonist and his wife interact. Their dynamic is so sweet; it’s hard not to love them together. BH: What are you working on now? RY: Another graphic novel, this time for children who are growing up into teenagers. It’s called “Seance Tea Party,” which is about a girl who has difficulty growing up and her friendship with a ghost. It’ll be published by Random House Graphics. BH: It is not easy to establish yourself so young — what would you say to students who are sometimes discouraged because of their age? RY: This is a bit funny coming from me, but really, look forward to getting older. Due to society’s emphasis on bright and young ingenues (30 under 30, etc. ), there’s this constant anxiety about accomplishing so much in as little time as possible, which makes us forget the joy of gaining wisdom and life experience. Your 20s are supposed to be about learning and growing, trying out new things, opening your mind, working on your person. At the end of the day, being outwardly successful has little to do with internal success i.e being kind, empathetic and joyful; accepting yourself in all your flaws and glory. BH: Have you experienced any discrimination or stereotypes as a young female comic artist? RY: Fortunately I’ve avoided most negative experiences (so far). Admittedly, my motivation to make good comics was born slightly out of spite towards the male-dominated realm of mainstream Malaysian comics, which viewed women as being creatively inferior. I’m happy to say female comics artists are the ones leading the industry now. The comics industry is undergoing a major change, opening up to marginalised voices and diverse perspectives. Obviously there is going to be some resistance, especially from people who believed the old status quo was better than it actually was. I more often encounter the stereotype associated with the false dichotomy of the arts and sciences. People are surprised when they find out I do both.